I love Pinterest. But at the same time, it’s a thorn in my side. There are so many wonderful ideas on there, that I just pin away, hoping one day to get back to those pictures and re-create a few of the masterpieces. When I came across this pin for sour grapes, I was mesmerized. We love sour patch candies here, and to know that there was a healthier way to have them blew my mind. I immediately pinned it and planned to make it for my family and my Dad, who loves all things candy. Then I saw it: it used Jello. My Dad doesn’t do Jello. My parents are Muslim, so gelatin is not in the cards for their diet. Also, if these turned out well, I was planning to add them to our Girls Night In party we do every year. This means that most of my attending family wouldn’t be able to eat them. I knew I had to come up with an alternative, and just like that, this Kosher, Gluten Free recipe was created. Hope you enjoy it! 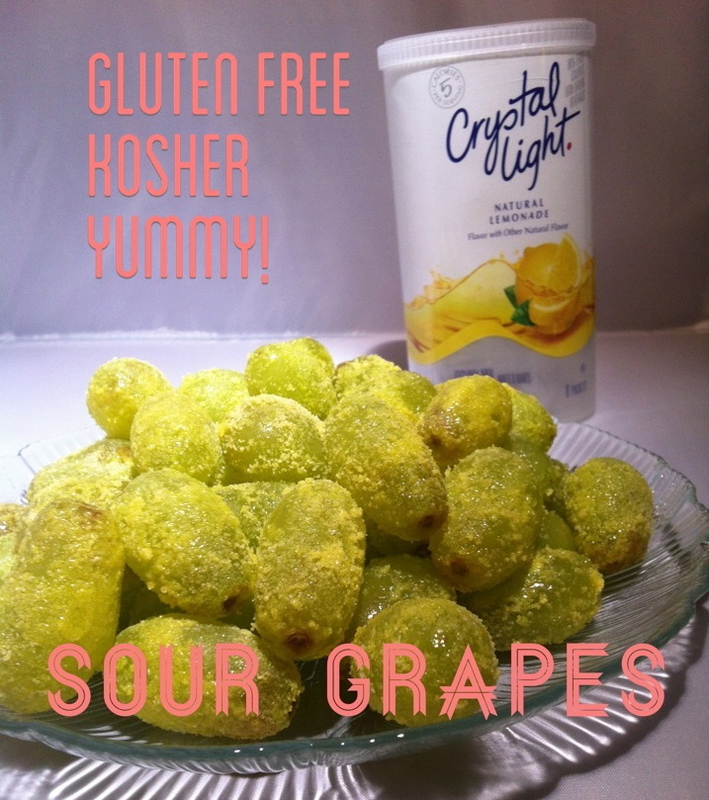 WARNING– These are super sour, especially if you use green grapes. They’re also addictive. Amen. Wash grapes thoroughly and let dry. Pull grapes off of the vine (if you haven’t done so yet), and place in a large bowl. Pour the tablespoon of lemon juice over the grapes and toss. Sprinkle the packets of lemonade (and the zest) over the grapes, and with a dry, large spoon, toss until the grapes are coated. Spread the grapes out on a large tray and place in the fridge(or freezer!) to let them chill for at least 30 minutes. – these would be a great treat for a Halloween! Call them “crusty sour eyeballs” and they’ll be a hit with kids and adults! -if the regular lemonade is too sour for you, try raspberry lemonade or another of your favorite crystal light flavors. – if you liked this simple recipe, show it some love and pin away!